The sight of birds sitting on the roof line of homes is not uncommon as they sit out their days near to an easy food supply but their droppings could actually be causing lasting problems. Aside of the mess and the risk of disease, pigeon droppings could also be responsible for structural problems and encouraging the growth of moss. Pigeon droppings are known to be acidic and this in itself can cause problems for roofing materials as if left to sit on the surface long enough they may start to erode the surface. Do pigeon droppings cause moss? Moss is a common problem on household roofs and opinion is split on how best to deal with it, but one thing is for sure, pigeon droppings can give moss a real growth boost. Moss thrives in dark damp spaces and frequently grows in the gaps between roof tiles, which could potentially cause structural issues in the long term. It can also pose a threat to drainage by blocking drains and gutters. Moss will also retain moisture which, again over a longer period of time could impact on the roof materials. Perhaps the main problem with moss on your roof is that it can appear unsightly. What is for certain is that if pigeons are regularly leaving droppings on your roof this will exacerbate any moss problem as nutrients found in the pigeon droppings encourage the moss to grow. Blocked gutters – are birds to blame? A knock-on problem of having moss on your roof is other birds picking at it to search for bugs and dropping it into your gutter. 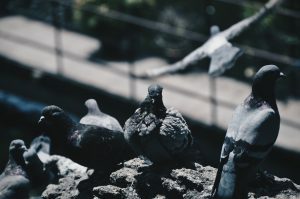 Pigeons and others birds can also create problems for your home drainage system through seeds contained in their droppings making their way into gutters and causing shrubs, weeds and grass to grow if left long enough. The solution is to regularly clear out gutters to ensure they remain free of debris left by birds so that the water can flow freely. Cleaning up pigeon droppings is a task that should be carried out by a professional due to the risk of airborne disease they carry, particularly when this has the added difficulty of being on a roof. Pigeon droppings on your roof can prove costly and unsightly and so, as with all pest bird problems, prevention is the best option. If you are experiencing a problem with pigeons or other pest birds contact Total Bird Control to put in place measures to help keep them away from your property. Take action to stop bird droppings becoming a problem on your roof – contact Total Bird Control for an effective solution.